FANTASTIC ARRIVALS AT TALENT QUATRO FINAL (419km) !! 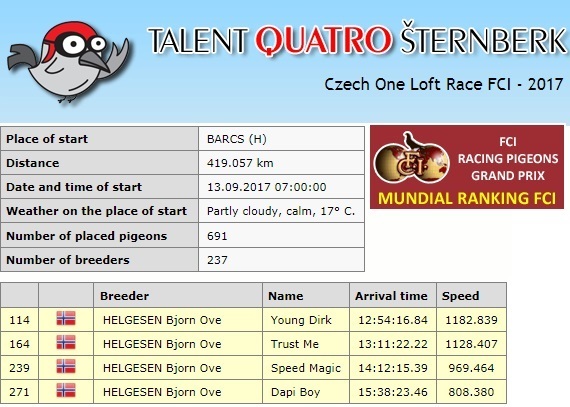 Helgesen Racing Pigeons deliver again, even though the top prize is missing!! We started with 6 birds at Talent Quatro and are very happy with all of our 4 final birds arrived very well in todays FCI final of 419km (334 birds arrived today, out of 691 final birds). The 114-prize winner “YOUNG DIRK” will give us more FCI points and ensure our loft still staying in the top of World Leauge 2017. 114 prize winner “YOUNG DIRK” is full brother of 19 ACE bird MIRA OLR 2017 and 58th prize winner at the MIRA FCI final (330km). Mother is inbred "Kleine Dirk" (3x grd.granddaughter) and "Golden Lady". Father is from Meldgaard / Jeppesen (KOOPMAN) and FULL-BROTHER "14-1023", one of the best racers in Denmark (2016). See our PAIR 13 for more info. 164 prize winner “TRUST ME” has very good OLR bloodlines. Father is 1 semi-final winner (525km) in Corabia OLR 2016 and mother is 5 ACE bird in Corabia OLR 2016, in additional to 17 prize winner in the final (565km). See our PAIR 3 for more info. 239 prize winner “SPEED MAGIC” is a grindchild mother 114 prize winner "Young Dirk" in additional to very strong bloodlines from Jens Borker in Germany. See our PAIR SB3 for more info. 271 prize winner “DAPI BOY” is Orginal Helgesen Racing Pigeons. Father raced 142e / 1164b (250km) and 337e / 840b (Final 350km) in DAPIRACE 2017, in additional - 3 other brothers with arrival at Algarve Golden Race final 2017 (505km), FARO final 2017 (93prize - 405km) and Osteeflug Usedom final 2017. Mother is grandchild "POKERFACE" from Andreas Drapa. See our PAIR SB2 for more info.